The next step here is to form the housings in the aprons, again using Paul Sellers' techniques. Deepening the knifewall on the left side housing. On the right housing, after knifing the line, chiseling a chip out down its length. After chiseling both sides of the right housing, wasting out the middle. 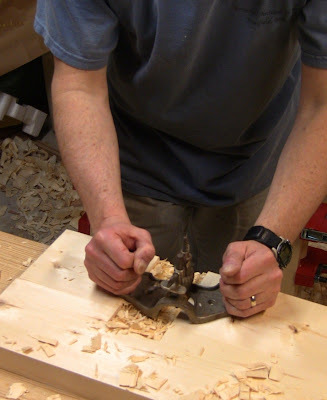 Final cleanup of the housing with a router plane. That's a snug joint. Test fit of the leg frame in the housing without any glue. Securing the aprons to the legs. The legs are just friction-fit into the apron on the floor here, to hold them in place while attaching the top apron. 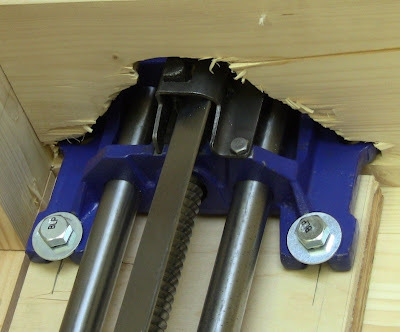 That's the advantage of snug joints, to temporarily hold things together. Screwing the apron to the leg after gluing. The screws hold it together so I don't have to wait for the glue to dry. Things proceed quickly at this point. I flipped the assembly over and secured the other apron. 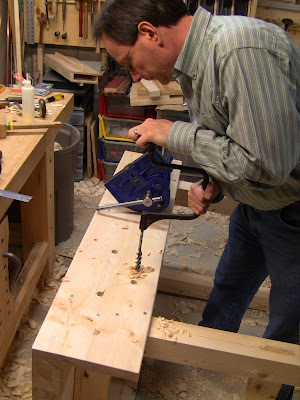 With the bench up on its feet, drilling the pilot hoes to screw the top to the front apron after gluing and clamping. Using a phillips-head hex bit in a brace to set the long screws the last half inch. This produces enormous torque, so go slow to avoid damaging the screw or overdriving it into the hole. Ripping the well-board to rough width to fit in the back section. I did the final fitting with a plane. Then I laid the bench on its back and screwed the bearers into the top and well-board from below. I also added battens under both edges of the well-board so it doesn't sag in the middle under the weight of tools. Trimming off a quarter-inch from the end to flush everything up. Then I cleaned up the end grain with bevel-up smoother and block plane. At this point, the bench itself was complete. Next was attaching the vise. 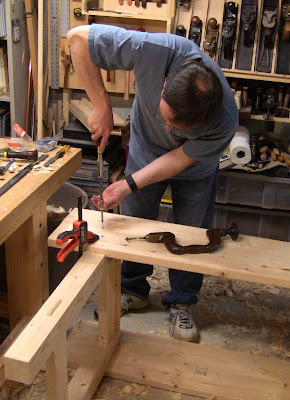 There are basic instructions on the Highand website, with more extensive instructions for this specific bench in Paul's book and DVD. 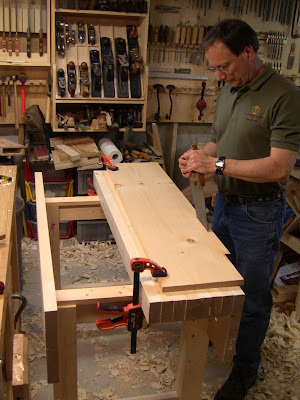 On this bench, I did a better job than the first one, because I formed shoulders in the cutout to support the front of the vise. These vises weigh just under 40 lbs. so they need to be attached with heavy lag screws. 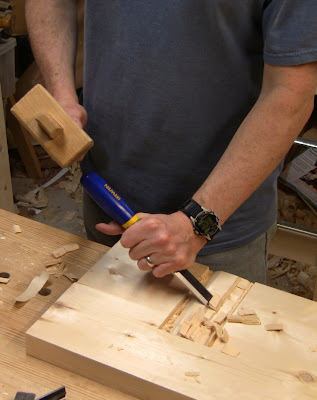 However, since Paul doesn't mortise his vise into the apron, and the apron is 1 1/2" thick, the front mounting holes in the base are unusable. The shoulders make up for that. Boring large holes at the corners of the cutout. Chiseling grooves to connect the holes. With the grooves thinning the stock, sawing out the cutout with a keyhole saw. I cleaned up the edges with a chisel. The vise sitting in the cutout. 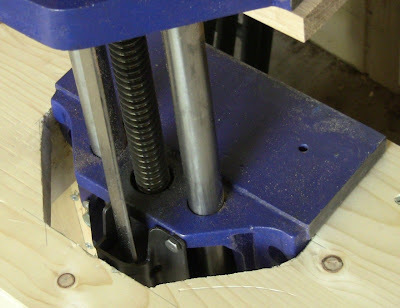 The screws are pointing to the shoulders, which fit the base of the vise snugly. Using a ratchet to drive the lag screws in the rear mounting points. 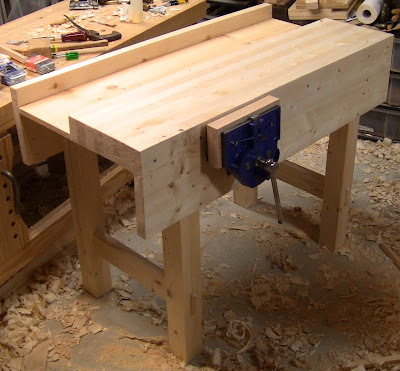 There's a spacer made up of two layers of plywood to position the vise at the right level relative to the top edge of the bench. 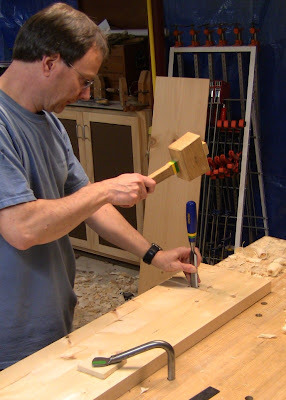 Drilling the mounting holes for the oak jaw. 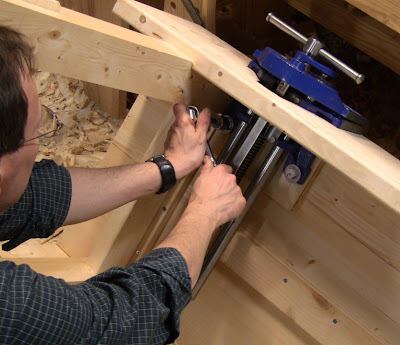 The inner jaw screws through the rear vise face into the front apron and top. 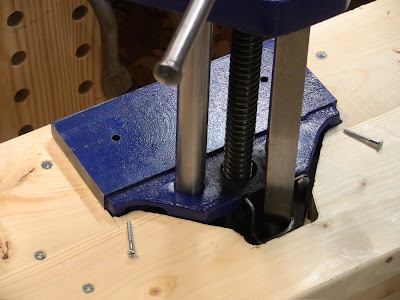 Between the lag bolts, the shoulders in the apron, and these screws, this vise is solid and secure. 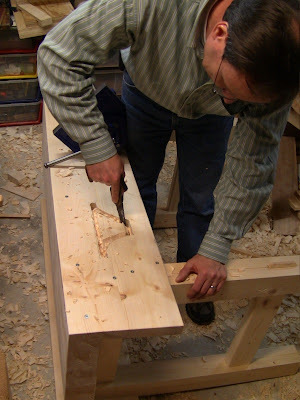 Trimming the two jaws to rough height after screwing them into place. Flushing the jaws down to the top of the bench, first with the #5, then the #7. The bench ready for use after chamfering all the end grain edges with a block plane and chisel. I removed the vises to transport the benches, since they add significant weight and throw them off balance taking them up the basement stairs. It also helps to have a son home from college and one of his buddies. After unloading the benches at the school, I reinstalled the vises. The following photos compare the vise cutouts and mountings. The first vise cutout, left, and the second, right. 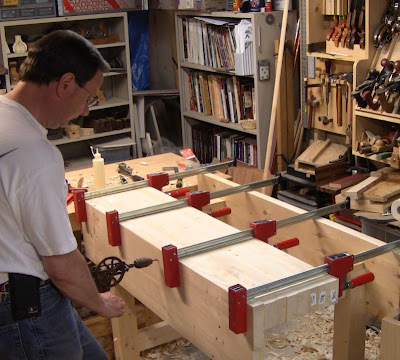 You can see the shoulders in the second one to support the front of the vise. The first vise in its cutout. 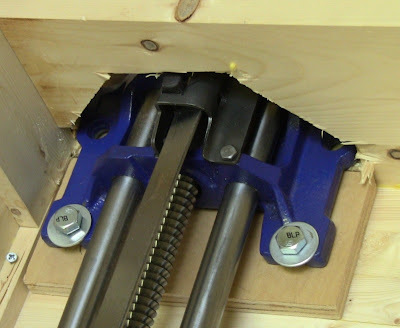 The screws though the rear vise face provide the only front support. Not good. Underside view of the first vise. Underside view of the second vise, with a good fit between the shoulders and the vise base. Note also the deeper cutout in the center, providing better clearance for the quick-release mechanism to open. After noticing that, I took a chisel to that part of the first bench, since it was jamming a bit. 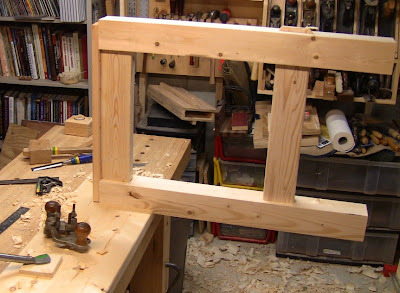 I'll glue and screw some support blocks to the inside of the first bench's apron to bear up against the vise base. 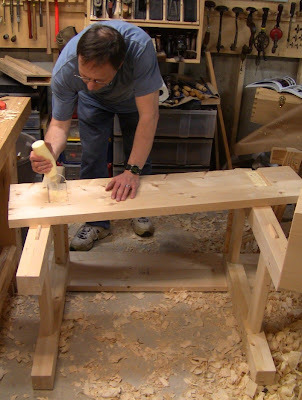 That will provide the same physical support as the shoulders in the second bench. Students will enjoy working on these. If they need to build a bench at home, this is an excellent choice. 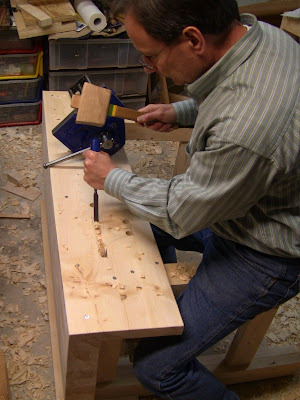 Could you mount the vice so that the fixed jaw is behind the apron and the moving section presses against the apron? Then boards would be clamped against the apron. In the configuration you've got do boards held in the vice stand away from the apron? The benches look great. My one question is the same as St.J's. Why not use the apron as the inner vise face? Wouldn't that make clamping easier? 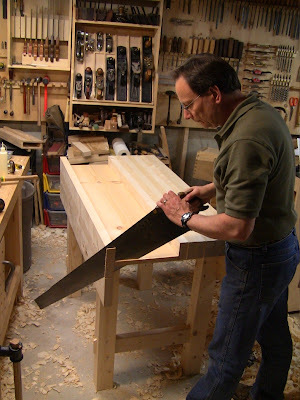 St.J, yes, boards held in the vise stand away from the apron. 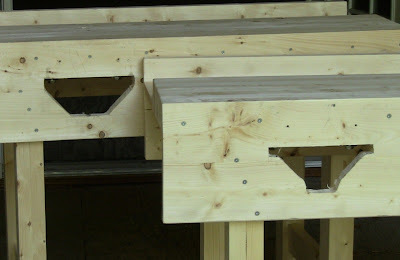 The instructions on the Highland website show mortising the vise face into the bench, but they show a wooden jaw over that, so boards still stand away. 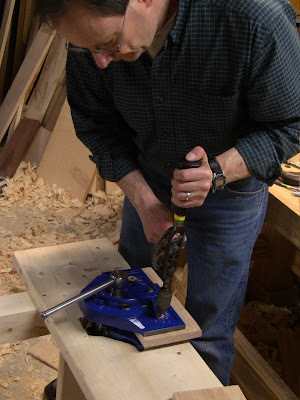 I mounted the vise the way Paul shows, and I note that Phil Lowe mounted his vise the same way. 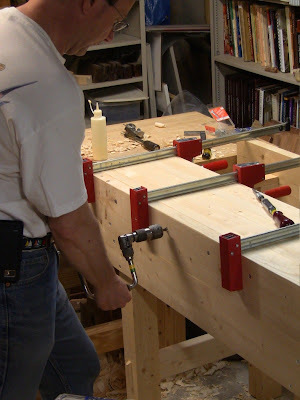 I also looked at my photos from CT Valley School of Woodworking and N. Bennet St. School, and they also had this style of vise mounted this way. So while I can't tell you why they did it that way, I'll defer to their experience here. Perhaps in use the reason will become apparent. The reason is very simple. 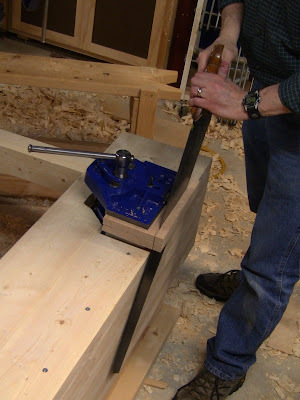 With the fixed vise jaw on the outside of the benchtop and not flush and the added jaw liner as well you can grip your work piece and place it in the jaws and close the front jaw of the vise without trapping your hand or fingers. It is so much easier than flush jaw. Thanks for posting this. I have all of the parts cut to length and have been planing them by hand when I get the chance. I figure I'm at least a week away from gluing up the top. I'm using fir 4x4's for the legs and construction lumber, spruce, for the rest. This will be a very knotty bench. Thanks Steve (and by proxy Paul). What an enormous amount of work to set up the school! Best of luck! The good news: You can still add a REAR wooden jaw liner for more finger clearance, if so desired. 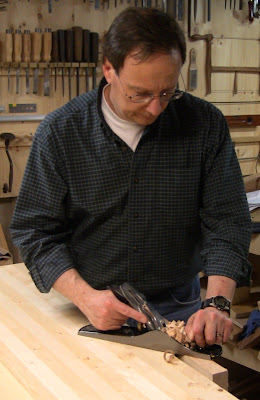 But of course, there must be a another reason why those woodworking legends don't do that. Great post! I was considering the Nicholsen bench as its out of 2x12 stock but now I am leaning towards Paul's. I'll buy the 2x12's and rip them down maybe as they look better than the 2x4 stock out here. I am 6' 3" so I like the idea of the taller bench. I have a 36" bench and I think it could be a bit higher. I will take Paul's advice and cut it down by 1/2" sections until its perfect for me. Thanks! I like the large tool tray, since it gives me a spot to set things down reasonably out of the way, where they won't roll or fall off. Because the ends are open, it's easy to clean. The main thing is to not let stuff pile up in it. Discipline yourself to only set the tools you are using right at the moment down in it. When you finish with them, put them back in their regular storage location. The bench is 24" deep total, which is plenty of room. 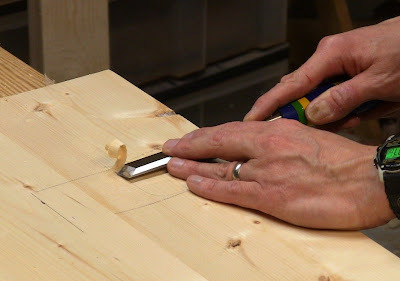 For height, I'm old enough now that I prefer to stand upright as much as possible, so I like my benches to be high enough to have my arm close to a right angle when planing edges or faces. As a hobbyist, I'm not planing for hours at a time, so that position is fine for my arm. But now maintaining back comfort wins out over arm comfort. Steve, excellent job, for one. I'm currently building my own Paul Sellers as well. I noticed you didn't create the wedge pieces on the legs as he did to prevent future looseness. Is this because you are not disassembling them repeatedly as he was? Has this worked good for you? Still solid, etc..? Mine will be permanent and never moved. In your opinion could I also forgo the wedges? The wedges are the best design feature of the bench to compensate for the compressibility of soft wood. Easy to add when you build, not later! Think long term and preserve your investment with wedges. A rocking bench will just be laughing at you and an endless source of embarrassment!